To become an Associate (Permanent Shopping Customer) of NMart one has to pay Rs 5500/- only. The Associate gets PREMIUM SUIT LENGHT and a PERMANENT SHOPPING NUMBER (User ID), through which they can login and modify their account. Access to NMART website is reserved for registered associates only. Associates will be prepped and notified offers exclusive sale and events in advance, by e-mails and SMS. Once you get the PERMANENT SHOPPING NUMBER (User ID), PREMIUM SUIT LENGHT, GIFT VOUCHER's, WELCOME LETTER, CREDIT VOUCHER are generated into your online account, which can be printed anytime. Please Note : GIFT VOUCHER must be printed on LASER PRINTER only. 1. NMart Retails Package (Rs.5,500) 2. NM Care Package (Rs.10,000) 3. NM Care Package (Rs.12,000) Benefits : Privilege Membership included in all the above packages. SAVE MONEY by using available shopping opportunities. Access to members-only areas of the Nmart web site. Educate and benefit your fellow shoppers within Nmart. Get recognition through ACHIVER’S CLUB. Each Associate will get free purchase vouchers of NMART Mall worth Rs. 220/- each month for 48 months, which can be redeemed at any NMART retail outlet across India. Nmart Associate can purchase any goods of their choice (except ghee, sugar or oil). These vouchers are generated online and is categorized monthly using BARCODE system. To redeem the voucher one has to go to the mall and verify it online after shopping. The voucher must be redeemed in the same month as it is valid for 30 days (not applicable for associates living outside 20 km area from Nmart mall). Please Note : GIFT VOUCHER must be printed on LASER PRINTER only. • NAME and USER ID display on the card. • ASSOCIATE PHOTOGRAPH display on the card. • It is a swipe card. • BARCODE on the Back of the Card. Once the associate receives the Loyalty Card, All his purchases are made from card. Like REPURCHASE INCOME transferred to the card account every month, Free Gift Voucher Purchase from the card and Rs.1500/- Credit Facility made easy via card. • It has photograph of the Associate on the Card. • If shopping personally no ID Proof required. • Safe as it has unique PIN system. In addition to the compensation plan company has also introduced credit facility of Rs. 1500/- for its Associate. It is generated into the associate’s login, for which photo upload is compulsory. Associate has to take a printout at any mall location across India to redeem it. It will be verified by the Store Manager and purchase can be made. Its statement will be generated on first of every month. Credit Payments : Associate can make the payments of their CREDIT ACCOUNT at any NAMRT MALL across India. Payment effect will be processed immediately. Associate will enjoy LOYALTY BONUS of Rs.11000/- if he purchases goods worth Rs.72000/- in 4 years from the date of joining. Terms to Qualify : To Qualify For Team Incentive Every Associate requires to Form Two Teams. By Direct Referring Two Associates in each of the team. • The Teams Will be known as First Team : Plus 1 And Second Team : Plus 2 • After Qualifying a tail is required to avail benefit of Working Incentive. • Incentive calculation is done based on working of both the teams. Associate can refer any number of direct referrals, After A and B your third direct will be called as spill over. On every spill over and his two direct associated ( A and B) you will get Rs. 200/- income on every Associate. After completion of 100 pairs in Working Incentive /Team Incentive you will be qualified to avail this income: Amount of Rs. 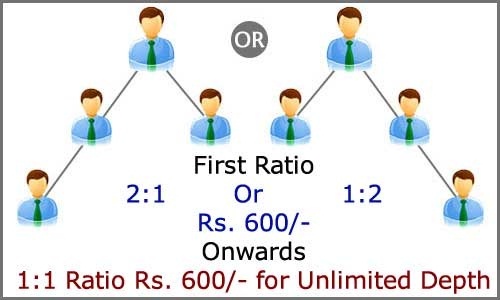 150/- from every new joining will be distributed monthly to the qualified achievers. After Qualifying for Royalty : To Obtain Royalty Income at least 20 / 20 new joinings on both sides every month is compulsory. • 10% TDS is deducted from weekly Payout Associates with PAN NUMBER, and 20% FROM associates without PAN NUMBER. • Administrative Charges of 5% deducted from weekly Payout (Minimum deduction amount is Rs.50/-).